A man has been arrested by police investigating the death of an elderly pedestrian who was knocked down by a lorry in Co Down. The collision took place on Windmill Street in Ballynahinch shortly before 11am on Thursday. The dead man has not yet been identified but it is understood he was in his early 80s. Initially it was thought that the driver of the six-wheel tipper lorry had been unaware a collision had taken place. 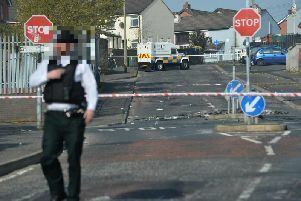 Appealing for the public’s help in tracing the vehicle, police said it had travelled through the centre of Ballynahinch and left the town along Dromore Street. The driver was later arrested when the lorry was located by the PSNI. Inspector Kieran Quinn has appealed for anyone who was on Windmill Street on Thursday morning and witnessed the collision to contact local police or the Collision Investigation Unit on the non-emergency number 101. South Down MP Margaret Ritchie has expressed her deep sadness after learning of the man’s death. The SDLP representative said: “I want to express my deepest condolences to the family of the man tragically killed after being struck by a lorry in Ballynahinch this morning. Windmill Street was closed for several hours before being reopened around 6pm.